Bujar Balaj ist gestern deutscher Meister 2013 im Vollkontakt-Kickboxen (WAKO) geworden. Bravo! A working class gym doesn’t require a membership card, a monthly fee or an enrollment. No money changes hands, not from athletes nor for coaches: we all contribute to the building up, maintenance and cleaning of our place. […] We have a coach but, as the years have gone by, older boxers or tai-chi practitioners have become coaches too and started teaching younger athletes, in line with the principles of autogestione (self-management) and horizontal organization. On Wednesdays we fight against each other, not with rage, but willing to improve. We know that in the opposite corner of the ring there’s a friend who’s trained, shared the maintenance tasks and will later eat a pizza with us. Popular and antifascist boxing is also meant as a response to the heavily politicized climate of many traditional combat training centres, where young men who are initially interested in fighting often meet right-wing groups and their neo-fascist ideologies. Which is why being anti-fascist is the only requirement in order to become a member. Several such centres are also open in Milan, in squats and self-organised centres such as Palestra Baraonda, Area Grizzly, and Sottoterra (apologies if we missed someone!). 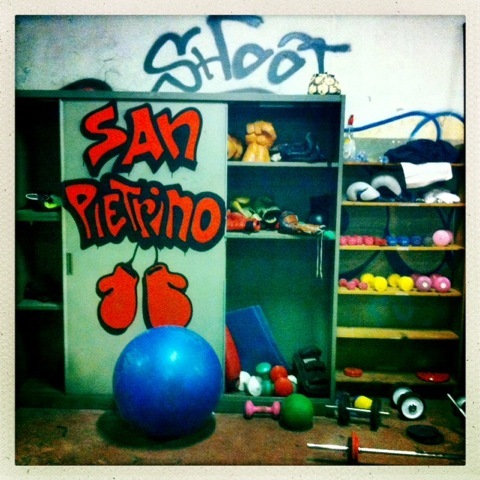 TPO, a long-standing squat in Bologna, also has a popular sports centre, where traditional martial arts (Muay Thai) and contemporary dance are offered to citizens and activists. Boxing training at the Palestra Antirazzista Red Rose is also organized by Crash, a more recent squat mainly run by students. Palermo also has a prominent antifascist boxing centre, the Antifa Boxe; Rome has at least two, the “Pallestra” at the Forte Prenestino and one at the Corto Circuito squat. In Cosenza the “ASD Boxe Popolare” has a longtime connection with the football ultras. These are only the oldest examples: sports centres also exist in Ancona, Naples, and many other cities across the nation. When, in January 2012, the first popular sports network meeting was held in Ancona, about 20 centres answered the call. While these centres do not constitute a common political front, they have promoted joint political action on some occasions. For instance, popular sport played a big role in the 10-year commemorations of Dax’s murder; members of different centres marched behind a common banner in the March 23 (2013) No-TAV demo. In addition to being extremely affordable and self-organised, these centres are also open to everyone, regardless of legal status – something that is not common in official sports networks. Popular and self-organised sport provides a radical alternative to the culture of commercial training and fighting. These centres promote a different view of the body, fighting gender discrimination, ageism, ableism and homophobia; they support a natural view of the body, promoting diversity against the artificial standards of fitness imposed by the market. They reject commercialization and commodification of sport, with its pricey and branded equipment and its exclusive premium memberships. Consequently, they empower the individual to be in charge of their own training and socialization — which also involves taking care of their own spaces, from management assemblies to cleaning facilities, painting walls, hanging bags and all the hard, sweaty labour of renovation. Finally, they strive to counter the male-chauvinist philosophy underlying some training philosophies, and any latent view of supremacy. It surely is a major shift of perspective, and one of the most interesting innovations of the glorious season of the Italian “centri sociali”. It may look like this model works only for boxing, rugby or soccer but TPO in Bologna has contemporary dance and nEXt Emerson hosts TangoSognato. Begun in 2008, this course of self-managed Tango now has more than 100 students at four different levels, so many that it was necessary (and possible) to build a parquet dance-floor of 100 sq metres inside one of the Squat’s big warehouses. Every month it hosts free “milonghe” (dance nights open to the public). Many thanks to nEXT Emerson for contributing to this article with their words and images; thanks also to the readers who have pointed out for missing names! Bujar hat die ostdeutsche Meisterschaft 2013 im Kickboxen (3 Kämpfe, 3 Siege, 3 KOs) gewonnen. Herzliche Glückwünsche! Du browst gerade in den Espace contre ciment Weblog-Archiven nach der Kategorie 'Keilereien'.